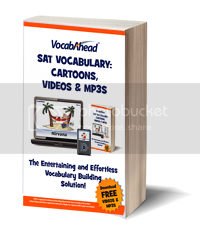 My oldest daughter (currently in seventh grade) tried our latest vocabulary review: VocabAhead SAT Vocabulary: Cartoons, Videos & MP3S. The book is divided into 30 sections of 10 words. She read 10 words one day, attempted the review quiz later the same week, and then if she was still unsure of any word she reviewed them. Each page shares a vocabulary word in bold print followed by its part of speech, definition, a cartoon illustration, two sentences using the word, synonyms, and antonyms. This 342 page book contains 300 words, 30 reviews, and a guide with usage recommendations. Additionally, instructions are included which allow you to access online videos and MP3 files for the words included in the book. Though it can be used as a helpful tool for vocabulary building and SAT test prep, the pictures and sentences that accompany the words in many instances do not reflect our family's values. For example, "bludgeon, noun, a club... A smooth, polished bludgeon fits nicely in your hand and is a really nifty weapon to use when fighting the neighborhood bully or some other really unpleasant person." Not all 300 of the words in the book used such negative examples. Such as the word ascertain which is demonstrated by a picture of a lady placing produce on a scale. "Laura wasn't very good at guessing how much her produce weighed, so she always used the scale to ascertain the weight." The picture provides a mental image to help your student remember the meaning. VocabAhead is available as a book for $16.99; they also sell other versions of this product. See what other reviewers have to say at the TOS Homeschool Crew website. Disclaimer: My family received a download of this program for the purpose of this review as part of the 2010-2011 TOS Homeschool Review Crew.